Caterfield as a daily driver ? Went in one the other day and that was basically a track car but it got me thinking as to whether a more road biased one could server as my daily seeing as I dont use a car much ? caterham / westfield, would be great fun in dry weather, but good luck in the winter. I've heard they make BMWs and Mercs look like competent off roaders in the Winter by comparison! Caterham SV is the "comfort" option with a wider body and a bit more kit. Avoid bike engines - a nightmare for road use. Best opt for the Ford Duratec unit or a Vauxhall block for better driveability. But imagine driving miles in one on a very wet motorway with lorries chucking up spray - total nightmare. Last edited by hodgy0_2; 06 July 2010 at 09:22 PM. Remember, most days I drive a pushbike, four wheels of any kind is luxury ! I can work from home pretty much whenever I want, we have the Galaxy and my Saab sits there. I was thinking the other options are a VX220 or Elise. I get the impression stuff like this gets to a point and doesnt depreciate much, you cant get any kind of Elise for much under eight grand, pretty much ten, the VX is a bit cheaper and Caterhams and Westfields for anything any good is ten grand minimum. VX220 Turbo would be my choice certainly over any caterfield westerham affair. If your bobbing a few miles to work yeah great, if your travelling any sort of distance especially in the winter day in day out you might get fed up. Location: Please excuse my Spelling - its not the best !! mmm thats a bit upsetting as I have been looking at these today - Do you happen to know what they are like on a motorway run ? In the dry they're ok but (so i hear) are hand built so they squeak and rattle a bit. They are a sportscar when all said and done and being light do tend to get buffeted by winds. The problem my mate had is he drove it all over winter on the highest motorway in England come raiin or shine and ice. They have real problems in the winter as they are skittish on the ice and struggle to demist and dont get warm. I will say this though, even though his was only a 2.2. N/A model it is without doubt one of the best cars i have ever, ever driven, even if not the fastest. I commute on a motorbike so anything with a windscreen looks pretty comfy to me. If you're willing to dress for it I'd say no problem. 3rd vote for a S2000. Have had a VX220 turbo as a daily driver. Great fun and could handle the rawness of the car, but I was doing relatively short journeys, and its was too much of a faff to get in and out and take the roof on and off. I drive a pushbike most days so not a lot will worry me. I like the S2000, never driven one but I kind of like grunty engines, turbo's, big capacity, I drove a Clio 182 and though it was flat as a fart, im lazy but I would like to try one, however a 200 bhp light, torquey, tunable mid engined car with some semblance of sanity like the VX220 Turbo does appeal more. Not getting anything at the moment as cant afford to but hoping to do somethign next year. No doubt about it the VX220 turbo is a cracking car and you do get ever so slightly more creature comforts if you can call it that over the elise. Apart from basically being a track day car, what also puts me off personally is the VX220 and Elises prices have gone up not down and the bubble could burst on them at some point. For example I sold my 2003 VX220 truly mint as I had it pro resprayed, covered 30K miles and sold it for 13.5K about 3 years ago. You would pay that or more for the same car today. And elises as you say you are now talking about 10K for a nice one, v's what would have been about 7-8K a year or so ago. S2000's represent better value for money IMO, more practical but just as much fun. But they are revy, peaky engines that like to be driven hard to get the best of them. The VX220turbo's are fairly linear and not what you might think though. Another car that is just superb if you don't do motorway miles is an MX5 turbo. There are plenty of FM1 and FM2 turbo conversion ones around pushing out anywhere between 200-240bhp and the one I had felt balistic quick to 120mph. But you were bouncing off the red line at 120mph and was screaming on the motorway at 70-80mph. Good hobby car and easy to work on yourself. Easily solved with a Quaife/similar reverse box or a starter motor based system. Seems quite a few do, but lets be honest, even if the car didn't have a reverse it's not that hard to push! But if you imagine daily drive in inclement weather with full roof etc be prepared for a completely misted up car and driving with 1 hand on the wheel and the other holding a shammy sponge then you get the idea as another drip goes down the back of your neck. If that is acceptable, welcome to the caterfield diehard club and yes, you can run one all year. I have had several Caterhams. You can run them all year, and I know people who do run them all year. The Caterham roof is quite good, and with a bit of playing you can get them to seal up well and very little water will come in. The main place water will come in is up from _under_ the doors at high speed in deep water as it comes off the front wheels and shoots up under the doors. Some extended mud flaps help this problem in the winter months. To keep the cabin from misting up most people unzip the rear window a little to let air flow through. 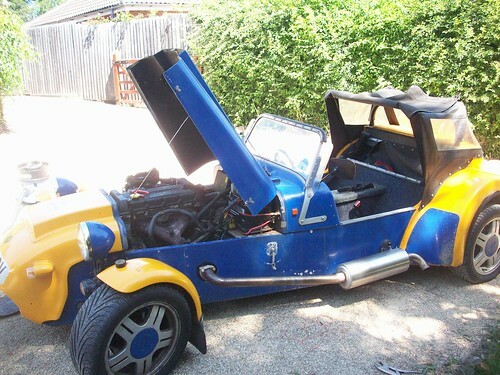 All recent Caterhams (about 1990 on IIRC) have heated front screens for demisting. Grit getting in the "grot spots" and causing chassis to rust. Roof is a pain to get on and off in the cold. As for driving in the wet, if you are reasonable they handle very well. Anyone who says different, IMHO, either has a bad setup or tyres or needs some tuition. They are not modern road cars but with the right driver they are fin in the wet. Watch out for white lines! CR500s are what you want for the winter. My concern would not be with the ability of the car, it would be the driver and the elements - they do not like salt. You would have to get it waxoiled a couple of times a year to make sure its protected. If you were considering keeping it for a few years as a daily driver I would consider putting some money to one side to get the chassis blasted and re coated when you come to sell. Not cheap as you would need a reskin. 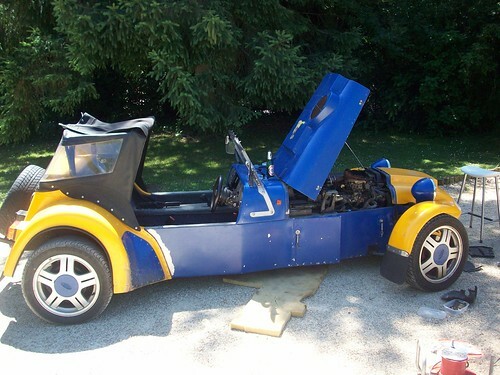 Also, consider most Caterhams will have low miles, anything with >5000 a year will be considered high miles. I know people with 20+ year old cars with less than 50,000 miles. I used to average about 3000 a year. Dry running only. Quick Reply: Caterfield as a daily driver ?